We’ve been featuring sewing tattoos for a while but it is definitely time for some yarny goodness! 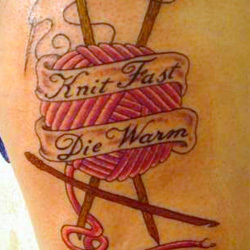 Maggielove‘s tattoo hits you with a little bit of knowledge that Craftster has been saying for a long time: Knit Fast, Die Warm! She was also able to sneak in a few other crafts in her knitting tattoo. There’s a crochet hook and a needle and thread hiding out around the skein! OMGosh- That is one of the best tattoos I’ve seen! I don’t even knit and I love it! I’m really NOT a tattoo person – but this one is FREAKIN’ AWESOME!